Mopsy (voiced by Elizabeth Debicki), Cotton-tail (Daisy Ridley), Peter Rabbit (James Corden), Benjamin (Colin Moody) and Flopsy (Margot Robbie) in Peter Rabbit. 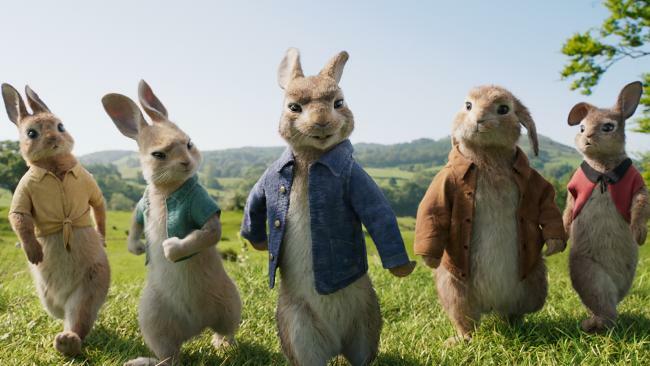 PETER Rabbit is older but no wiser in this jaunty hybrid movie, set several years after the events in Beatrix Potter's beloved storybooks. The hyperactive lagomorph knows what happened to his father when he raided Mr McGregor's precious veggie patch to provide for his hungry young family. But he simply can't help himself. 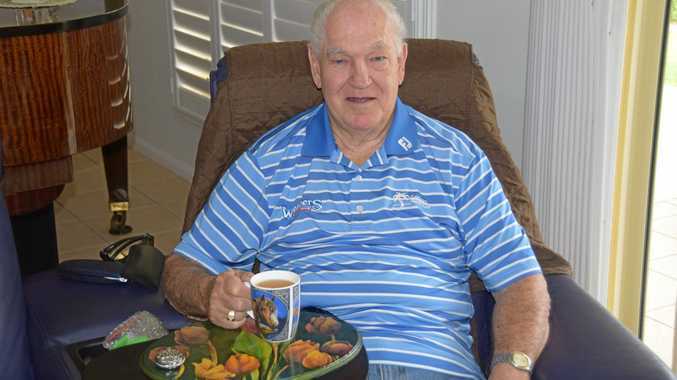 Peter continues to taunt the red-faced old-timer (who bears an uncanny resemblance to Sam Neill), plundering those prize tomatoes, looting those juicy green cucumbers, convinced of his own immortality in the face of all evidence to the contrary. And now he does so with a cocky adolescent swagger. 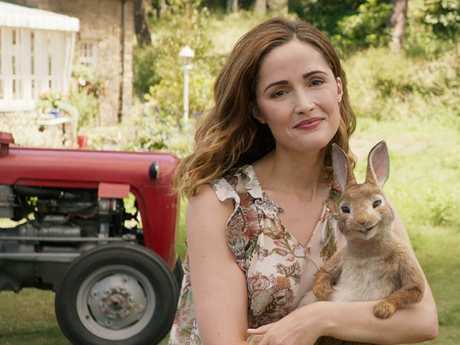 Bea (Rose Byrne) and Peter (voiced by James Corden) in a scene from Peter Rabbit. According to director Will Gluck (Easy A, Annie), each of us has our own memory of Potter's enduring classics. "Our relationship to it is more than what happens in the material, because nothing really happens in the material," he says. Gluck was impressed, as a youngster, by Peter's rebellious spirit. "I took from it how mischievous he was ... when you are told your Dad was put in a pie for doing something and you do it anyway." This reviewer, as a small child, was struck by a very potent sense of danger. That menace is missing in Gluck's live action-CGI blend - for James Corden's Peter Rabbit, tormenting McGregors is merely sport. Corden is well cast in the title role. The Late Late Show host's wisecracking take on Potter's winsome character is very much of its time. Peter Rabbit (James Corden) with his nemesis Mr. McGregor (Domhnall Gleeson) in Peter Rabbit. He is supported by an impressive vocal cast that includes Margot Robbie, Elizabeth Debicki and Daisy Ridley as the triplets Flopsy, Mopsy and Cottontail. Gluck and his team flesh out the story with a live action romantic subplot involving an eccentric animal-loving artist named Bea (Rose Byrne's delightfully daffy modern incarnation of Potter) and the aforementioned McGregor nephew, who wriggles her way into her affections against all the odds. A jealous Peter immediately declares war on the stitched-up city boy. 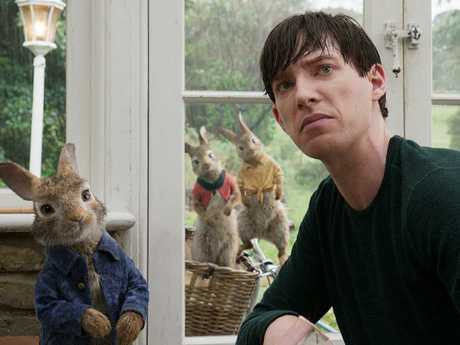 The physical comedy between the small, quick-footed rabbit and Gleeson's tall gangly adversary is nicely calibrated - even if the CGI-live action blend sometimes strains. Peter Rabbit is competent contemporary makeover of the much-loved children's classic. Young audiences will be charmed by Animal Logic's artfully animated animals.